One sunny Spring afternoon in 1968, I was a recently arrived English immigrant and cub reporter on the Kansas City Star. 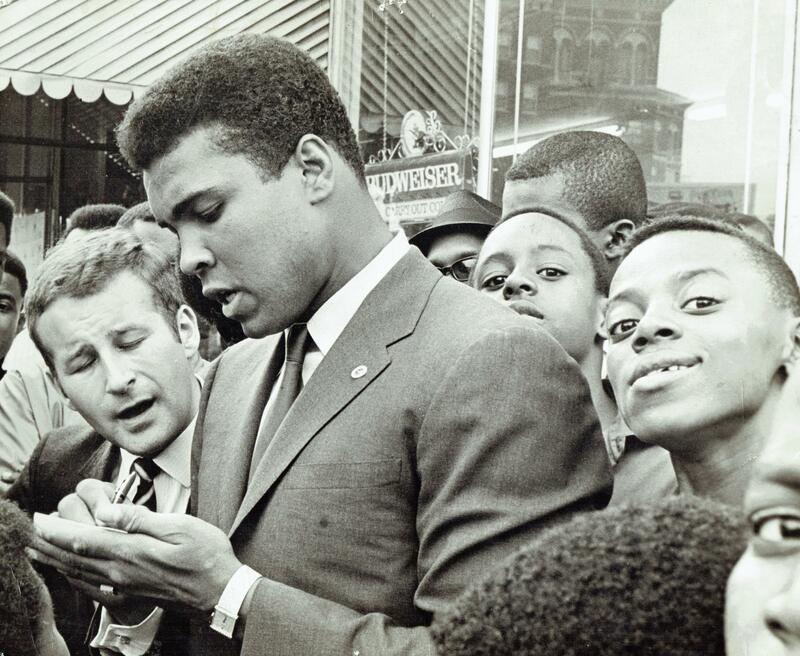 Cassius Clay, now calling himself Muhammad Ali and in legal and boxing limbo, was in town to speak at a local mosque. His Muslim handlers refused to give the media any information on his schedule. My assignment: Find him and get an interview. With no cops in sight, I was scared, especially when I felt a steely hand clamp on my shoulder from behind. When I turned, I was looking at a huge man in an electric blue suit and snap-brimmed hat, crisp white shirt and skinny black bow tie…. one of the famous Fruit of Islam bodyguards. “What do you want son,” he asked quietly. “I’m a reporter for the Kansas City Star, and I’d like to interview Mr. Ali” I stammered, reminding myself not to say “Clay.” The hulk told me not to be afraid, and began guiding me through the crowd. It was quite a show, the crowd was growing more hostile, and now I was really scared. Then Ali put his hand on my shoulder as if to push me away, leaned in close, and whispered in my ear: “Six o’clock. Admiral Motor Inn.” The bodyguard steered me safely back to my car. In that brief and bizarre interlude decades ago, Ali used me as a theatrical foil for the entertainment of an adoring audience. He repaid me with honesty and respect, opening his heart and sharing his time and thoughts with a young and unimportant reporter. The interview was the first byline I earned at the KC Star and it launched my life career as a print journalist. That day, May 28, 1968, I became an instant, dedicated, lifelong fan and admirer of the boxer who went on to become a beloved global legend. Michael Satchell went on to become a writer for the Washington Star and U.S. News & World Report.